Populist reform trounced the status quo in Osaka Sunday evening as former governor and Osaka Ishin no kai leader Toru Hashimoto, 42, won the mayoral election and Ichiro Matsui, 47, a senior leader in the same party and Hashimoto's hand-picked successor, clinched the governor's seat. ... "From the beginning, when we formed Osaka Ishin no kai last year, our message has been one of concern for all of Osaka, the city and the prefecture, and our policies have taken that into account," said Matsui. "We're at the starting line. The next step has begun. Our party has had one policy. But politics means dealing with a variety of opinions and values. What everyone (who supported us) had in common was a desire to realize the goal of one Osaka political entity," Hashimoto said. 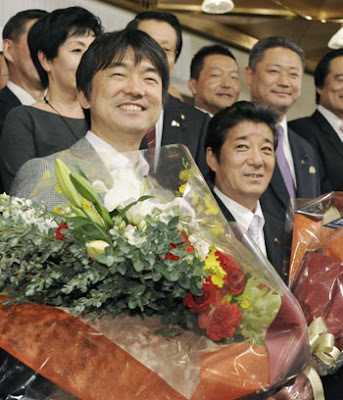 However, both candidates admitted that more explanations of what unification will mean for local democracy under Osaka Ishin no kai's merger plans are still necessary.